How did you become a fashion designer ? I studied political science. I had one degree from Chulalongkorn University, and then I went to university in San Francisco. From that, I took a detour before becoming a fashion designer : I worked for the government of Thailand.Then I worked many years for a public relation firm to do publicity for corporates. Until one day, I realised that my hands were made for creating something. When I was in the U.S. , I visited a friend in New York who studied fashion design : that had captured my attention and thought this could be a path for me. But it did not happen until one day, at the age of 31, I realised that I needed to make a change. So I went to a fashion school, and started from the beginning. Even if I was not young, I thought I needed a formal education to learn how to think like a designer and to understand the technical knowledge about it. 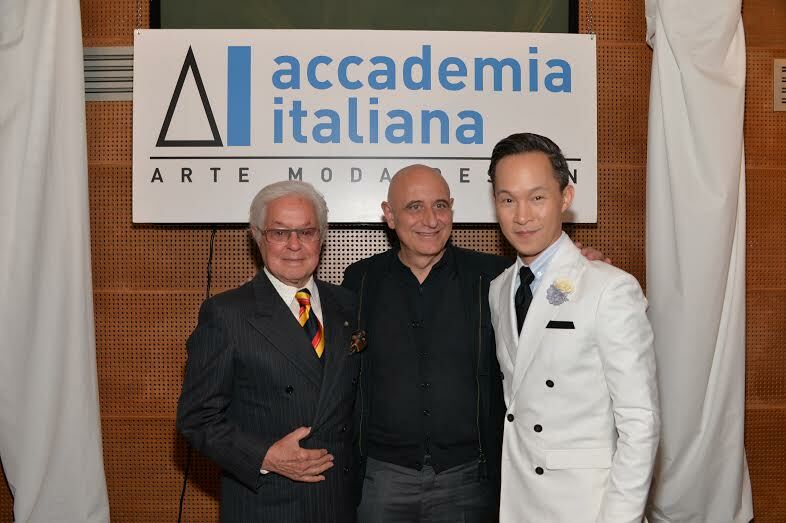 I was in Accademia Italiana in Bangkok for one year. I didn’t quit my job, I worked part time. My teacher saw my work and told me : maybe you should show your work with the 4th year graduates. When I saw my work on the runway I knew immediately : my instinct told me that it was the path I needed to go for. I decided to make a change with my life and fully devote to that. My hands will create what I believe to make women happy. And I’m going to jump 100% . Because I studied political science, I think this way : you evaluate your situation, you set your goals and you think how to achieve them with tools and strategy. At the end of the line I wanted to have a fashion business. It’s not only about sitting and drawing. I have to work with people, so my task is to find a good team, to start with a small company and make it bigger. Personally and professionally I needed someone to endorse me. If I started from zero it would take me so long.I went to see a legendary designer of Thailand ; Khun Kai, Somchai Kawtong. He has been in business for 40 years and he’s the number one couturier . I pitched myself to become a designer for him. He somehow saw something in me and gave me the title of fashion designer for his newest brand, a streetwear brand. Next thing I know I launch my collection for him under the brand name K & I for the Bangkok Fashion Week in 2011. There were only 5 brands featured. 2 months earlier I was a student at school who just graduated from the first year and next thing I show my work on the runway at a fashion show along with very well respected brands! I made the media aware about my work and it was easier when I set up my own label with my own firm because they already knew about me. It was a one year contract with K & I, one big season. Then I decided to build my own brand and name it Tawn C. It was very straightforward ; I’m going to show women my design and what I believe in. I design, I create every pieces that comes out so my name is on it. I want to show how much I get involved in the process of making the outfits. Can you tell us more about the notion of empowering women ? Clothing and fashion are two separate notions. One is a necessity to go out. The second notion is about how they see themselves in it. I believe that clothing has that power for people. Men like wearing a suit ; it’s like an armor, they feel stronger. Women have more pieces, more texture and it transforms them. I believe clothing can make someone happy by thinking about who they want to be, what kind of attitude they want, and what they expect to happen in their life. Wearing something and having fun with it, that’s what I believe in. One word that can capture my work is imagination because I’m a man who designs women’s clothing so I use my imagination to create the best for them. When they put it on, they imagine who they want to be, have fun and be happy. What fabrics do you like to use ? When I set up my brand , from day one, I want 3 DNA to stay with the brand : the first is to use good quality material, the second is to have an excellent craftsmanship and the third one is attention to detail. For every collection, every piece, everything that comes out of my shop, I ask myself if these 3 points are respected. Concerning the first one, good quality material ; the material varies from season to season. Some seasons I use a lot of chiffon silk because it’s light and airy , other seasons I use Italian silk because it’s heavier and tougher to create texture, sometimes I use Thai Silk. It depends on the mood and how I want that collection to be like. It’s varied but it needs to be good quality material above all. Where do you produce your clothes ? I have 5 different seamstress houses that work for me. When creating a collection I make sure that I have clothings that comes from different skills. One of them do a lot of laces and basic skirts and pants. The second one do a lot of tailoring like jackets , underwears and tailored pants. Third one, evening gowns. Forth, embroidery. Last one makes pieces more basics and more commercial.I am a designer and also a project manager. I order to one craftsman then I move it to the next one until the finished product. I produce 2 collections per year, 25 to 30 lots per collection. For each collection I create 40 to 45 pieces and then we edit it to be 25 looks and then when it comes to production we make 4 sizes, 2 colors . You worked for public relations, does it help you now ? Yes and no. I think my PR skills are useful when it comes to explaining. But that is a communication to tell a story. I don’t use my media skills because I’m on the opposite side at the moment. I’m a fashion designer, I have a story to tell, so basically I just go to the basics on what is it, what I create, and why I believe in it ; this is the story. The media will come to me and I tell the story. It’s a honest thing. 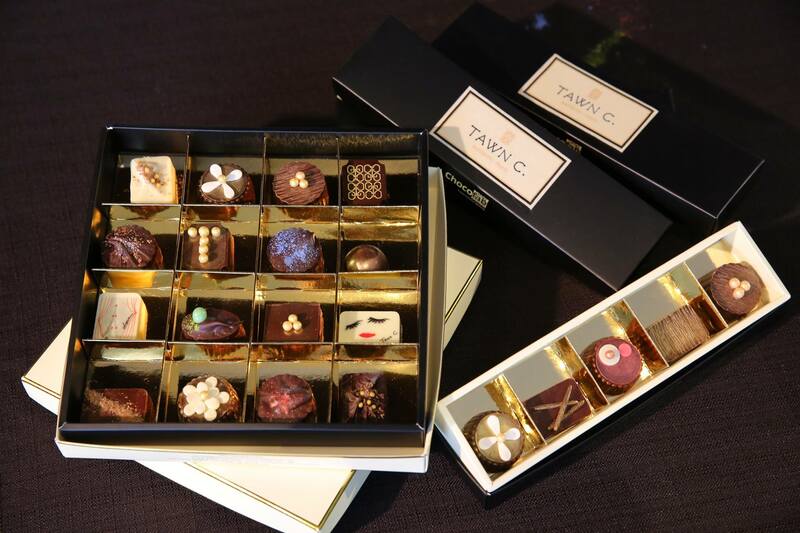 For example when I created a chocolate collection, I got inspired by Paris and my love for Bangkok and we got it launched at Bastille day because it’s a time to celebrate.Chocolates are sweet and I love them. It’s as simple as that. If it’s a good story and I tell it well, it becomes a good publicity. When I create a collection, there are 3 aspects . I just let my imagination go. 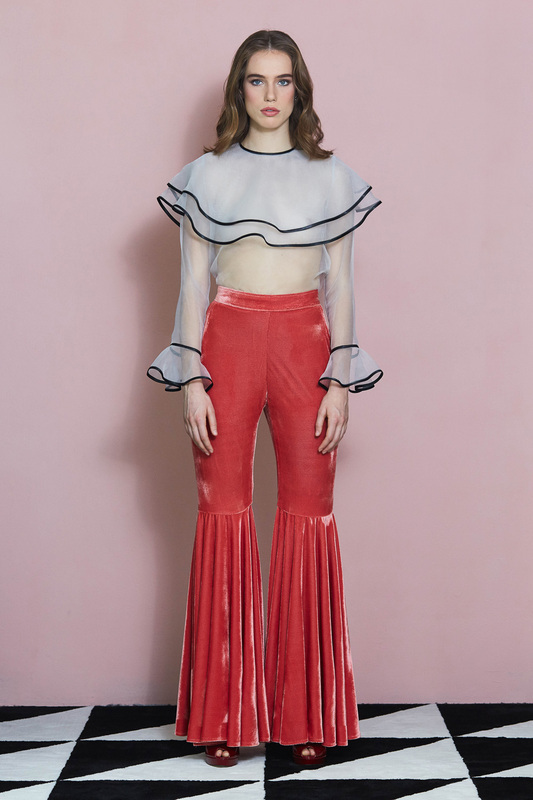 This collection is about a woman who travels in time. I was inspired by a photograph of 3 different cities from 3 periods of time. A woman, an imaginary person, go to 3 different eras of this photo, travel to time (1970, 1980, 1960) and get inspired. She meets a guy, she falls in love and has to think whether she goes back to the person or stay in the past.That kind of dreamy and imagination story. I ask myself what the silhouette and the colors of the collection would be. I think about the primary colours ; black and gold. For the secondary colours I’m gonna introduce canary yellow, and empress green like jade. The silhouette could be more structured or it could be more flowy. The most important one. As a dressmaker I have to think about what kind of technique I would use to create my collection. For example, my current collection called “From Porto with Love” is about layering, I use 2 different types of fabrics to create layers. The different textures will play interestingly in the experiment part and use cut out lays to create shapes and pattern. These three combinations become a collection ; the story that I would tell, the color and shape, and technics. I was very honoured because I went to school here for one year. 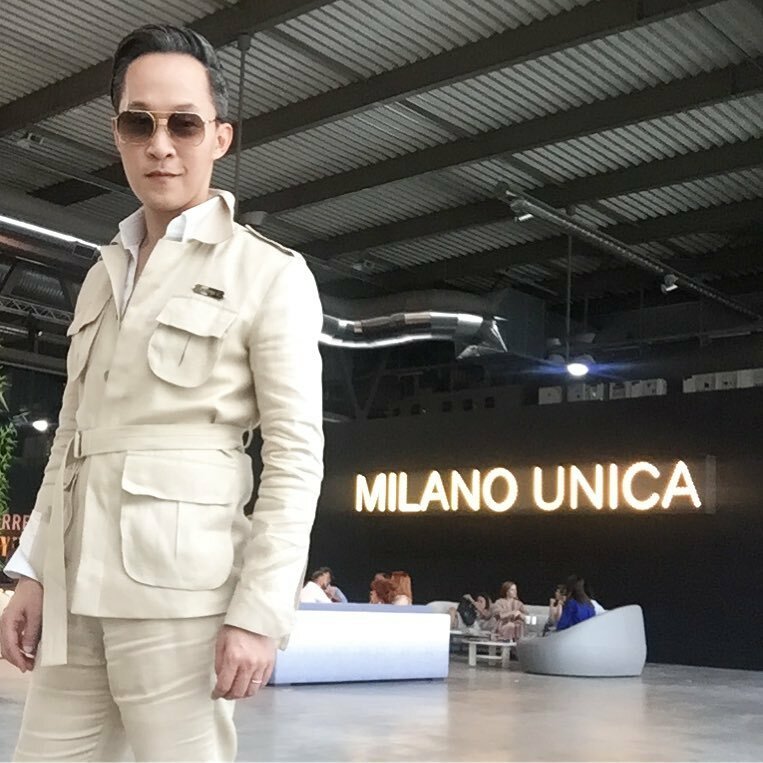 In 2016 they told me that the comity would give me the honour award as a designer, and I was grateful when I saw the list of people who received it , Fendi, Giuseppe Zanotti, etc… I was the first Thaï designer to receive the award. The committee mentioned that my work became outstanding and decided to give me an award. So I flew there and accepted it.The same year on the stage they honored Roberto Capucci who is an italian designer ; he designed a lot of clothing for performers like Oprah and other celebrities. I was honoured to share the stage with him. One person comes from Asia, and the other is a legendary Italian designer. Are you often traveling ? I travel a lot for my work. I go to Paris twice a year to launch my collection for the fashion week, because we have a showroom there. Once a year I make a trip to look at materials, to search for techniques. Fashion is an industry, it’s growing, it has technology, new things, I need to move. This year I went to Milan to look for materials.It’s a big fair. People come from all over Europe to check out the latest textile creations ranging from techniques, embroidery , factory. How do you find your inspiration ? I love to travel. It raises my spirit. I love to see new cities, to go to different environments. It takes me out of everyday’s work. Managing a business in Bangkok takes a lot of my time. I have 3 locations in Bangkok : Gaysorn Plaza (the flagship store), Siam Paragon and Emporium. We sell to Paris, Kuwait, New York. I work on day-to-day production and create all the time. If I have a chance to stop and travel, I live the daily routine behind and open my mind. That’s when creativity comes. Do you take notes when you are on the spot or do you keep it in your mind and create when you’re back home ? A lot of people ask me how I work as a designer : if I just sit and draw. Well, It’s not the case. It’s about a story, technics , shapes and colors. Looking at things. I usually don’t draw during my travels because it’s already in my mind. I would draw when I come back because I need to explain to my seamstress what I want.I may draw different pieces that I’ll give to different people and at the end I will gather them and make it one outfit. They may not see the whole thing. What are the main countries where you present your work ? I am represented by the showroom Demanvinssy rue de Castiglione. It’s a business to business showroom. We use it as a sales office for buyers. Also there’s a shop called Les Suites, not far from Georges V.
We have a boutique in New York called Albright that carry our pieces. Another one in Kuwait, and next year in Moscow. 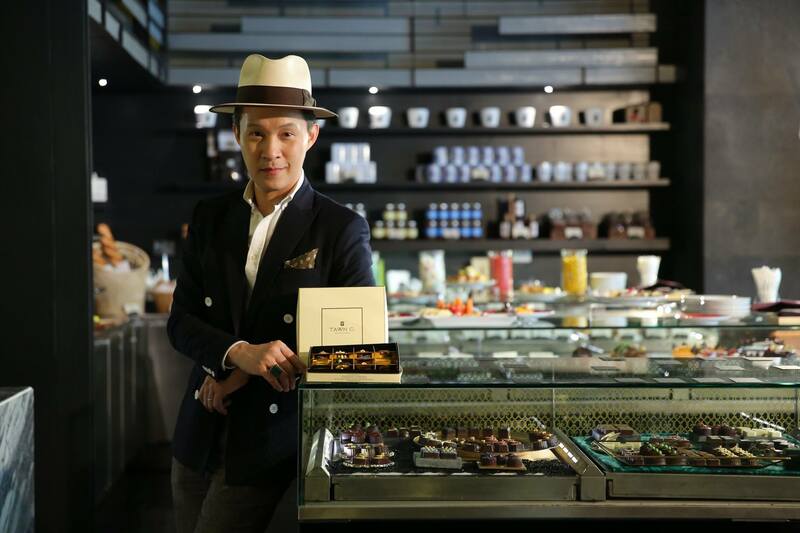 How did you have the idea to make the chocolate collection “Bonjour Bangkok – Sawasdee Paris” ? It started from a conversation I had with Sofitel. One day we talked about a subject related to food and I told them I would be interested in designing in this field. They have a chocolate room. 2 years ago we experimented some capsule collections, I designed 9 pieces, it sold well.So I had the experience and was ready to create a full collection. We started this year , they gave me a lot of freedom. I call Paris home and I wanted to do something related to France. I wanted Bangkok, my home town to be a part of it. When I traveled back to Paris I gathered inspiration at the Centre Pompidou, the river La Seine, the Luxembourg gardens, and textures from the fountains with the bubbles in the water. I wanted to translate that into the collection. I see something and I want to put it into my creations. The story is about the 2 cities that I call home and I want to give them a tribute. The flavors are next between the 2 cities. The name of the chocolates as well : Pompidou, Luxembourg, La Seine. They can be found at the SO Sofitel in Bangkok. What do you like to do when you have some spare time in Paris ? Work comes first ; I usually have to attend many meetings. Then I can enjoy the city by walking, observing the way of life. One of my favorite neighborhood is Le Marais. I want to feel the atmosphere.I want to absorb, to know what it feels like to be a local. That’s why I go back to study french ; I want to be able to speak with my french friends in their native language. If I have the opportunity, I’d like to go and visit different cities outside of Paris. And off course I enjoy the food, the small shops that produce french specialities. Each time I go to Paris I have a mission : to find the best product in a certain category. For example, the best croissant, or the best confit de canard. I try different shops and I rate them. Among my favorite shops for croissants are Du Pain et des Idées, La Parisienne (Saint-Germain), la Patisserie du Panthéon. What differences do you see between the Fashion scene in Europe and in Asia ? I don’t see too much differences. People may have different taste and different style. Each market needs different things and I don’t think it’s a challenge at all. When I create a collection, I have to make sure that each pieces has variety to serve different markets, I need to be sensitive on that, because people have different sizes, heights, shapes and styles. A well constructed collection needs to be flexible enough to serve different requirements. I have to understand the market and listen to the customer . Where are you gonna travel next ? 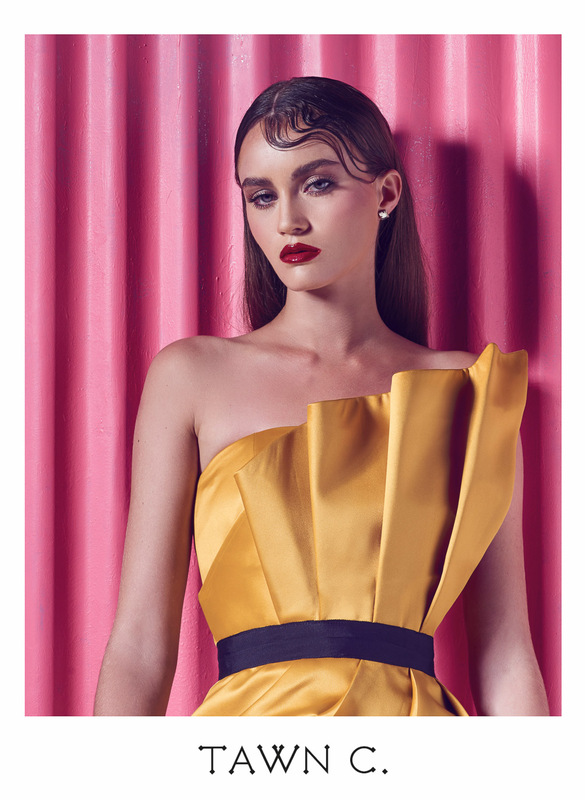 Paris, in September, to launch my 2018 spring and summer collections.The name is From Porto with Love part 2 . I launch it together as one fashion show. There are 2 messages that I want to say ; one is about imagination, the other is about passion. There will be a lot of pink, a lot of flowers, very light . I will have a fashion show on September the 16th in Bangkok. After that I’ll bring the collection to Paris to distribute, to show it to my buyers. 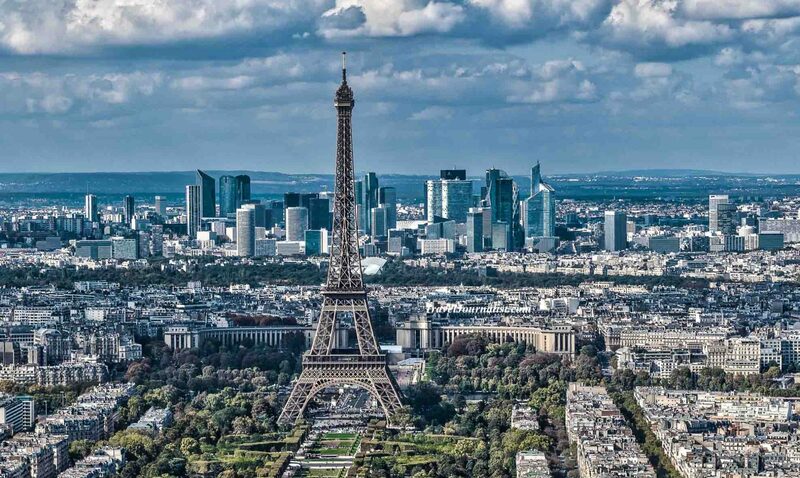 Paris is 6 month ahead of the other markets. Buyers will place the orders and I will produce for my own shop here in bangkok and for other locations. After that we launch it locally, the same time as the other shops will launch as the season came in. This time, I haven’t launched my autumn/winter collection yet. My schedule is ahead of time because I’m based on the Paris timeline. So I combine the 2 collections in Bangkok at once. Very unusual timeline but I’ll make it work for my vip customers here. My career is about passion. I love creating women’s clothing and I believe that imagination is very important for me. From time to time I need to travel, I need to do different things, that exercise my creativity in different ways.From creating a clothing collection, to creating a chocolate collection. It maybe different material but I use a similar approach to creativity and I enjoy it. I want people who buy my products to be happy, I believe that the energy that I put in will make them happy.